These gate phones are designed specifically to utilize the characteristics of a standard telephone entry system, and apply them so they are best suited in a private residential environment. This means that there is absolutely no standard phone charge involved for use! Each door and gate phone is equipped so that access can be granted whether or not a resident is actually home. Also, gardeners, housekeepers, etc. can each be given a unique entry code that can be programmed to work only at specific times of the day. These phone entry systems are built for longevity and durability, and will help enhance the privacy and security of your household. The DC-TEH1 is a single residence, hands-free telephone gate entry system for use by a private household. It works by using the existing telephone line for communication and access control. Since calls do not go directly into the telephone company network, there is absolutely no charge for calls made on the system. When visitors press the “call” button on the illuminated faceplate, the phone call is received by the residence just as any other call would. Gate entry calls can be discerned between regular phone calls by adjusting the ring mode on the device. Residents, or trusted guests can also enter the premise immediately by entering in their own personal code. Provides resident controlled guest access for private family residence. Allows gate entry with "No Additional Phone Charges". Provides individual secured entry through the use of up to 50 programmable, 4 digit "keyless" entry visitor codes. Vandal resistant, #316 stainless steel construction promotes durability and security. 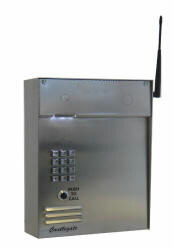 This is a completely wireless, hands-free, gate entry phone system. It utilizes the latest voice over IP and non-line of sight 900MHz broadband radio frequency technology, for communication and access control. This system is unique in that it works with all of the residents existing phones throughout the RDIM interface. Therefore, because calls do not go through the telephone company’s network, there is no charge for calls made on the phone system.